Bates Smart has reimagined one of Sydney’s most iconic buildings, creating a new luxurious hotel opening 6 November 2014. InterContinental Sydney Double Bay is the result of a significant refurbishment of the once-celebrated Ritz Carlton, frequented by local and visiting stars and dignitaries, during the 1990s. The new design accentuates the best of the original structure, adding sophisticated modern accents. Bates Smart Studio Director, Brenton Smith, says the design combines classic resort style with a contemporary Sydney twist. 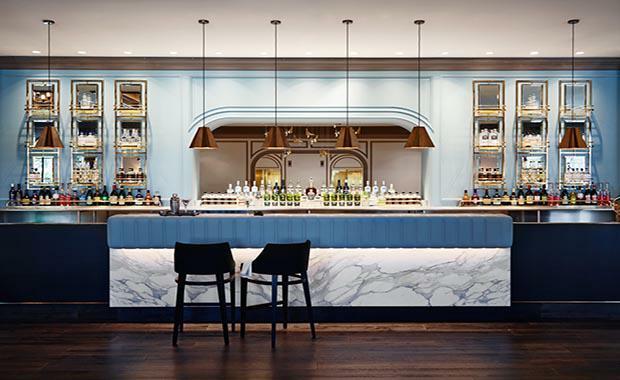 “The approach we took was about contextualising the hotel in its immediate environment and reinstating the glamour back into Double Bay,” Mr Smith said. The theme of understated luxury is evident throughout the entire refurbishment, which included an overhaul of the rooftop area to create a sophisticated pool and bar setting for hotel guests, with panoramic views of the harbour. “For us, the jewel in the crown is the Rooftop Pool and Lounge. The space presented a fantastic opportunity where we were able to frame bay views in an intimate setting,” explains Mr Smith. Other features include the Grand Ballroom that can facilitate up to 495 guests, a revitalisation of the original marble reception and intimate destination restaurant, Stockroom. InterContinental Sydney Double Bay also has 14 Executive Suites and 1 Royal Suite, with private balconies. The classic marble and leather-clad Stillery gin bar encourages guests to mix with locals around in a relaxed setting with a subtle nautical theme, paying tribute to the nearby bay. “It’s the super yacht of bars,” Mr Smith said. The building was constructed in 1991 with a classical European design, and was purchased by Royal Hotels Australia to be delivered in partnership with IHG (InterContinental Hotels Group) as the fifth InterContinental hotel in AustraliaBates Smart is an architectural practice with offices in Sydney and Melbourne. One of Australia’s most established and highly awarded firms, it has an unparalleled experience and knowledge across a range of sophisticated projects. The design-focused practice has worked extensively with major hotel groups including Crown, Four Seasons, Radisson, Shangri-La and Pier One, and restaurants such as Rockpool Sydney.